Sally 4th gives you some more options with their Figure Storage System in their latest update. 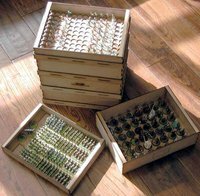 Two weeks ago, we launched our Warchest system for storing and transporting wargames miniatures. Demand for our initial products have been great, and so has the number of suggestions that we have received suggesting ways to make the Warchest system even better. The system has been designed to be a mix-and-match system, so that our customers can choose the best combination of products to suit their particular needs. Boxes cost from £6.25 GBP-£9.75 GBP. 35mm deep box – magnetic- or steel-paper-lined. 52.5mm deep box – magnetic- or steel-paper-lined. 70mm deep box – magnetic- or steel-paper-lined. 100mm deep box – magnetic- or steel-paper-lined. Clear perspex lid, so you can see contents without opening, while keeping the dust and household pets off of your prized processions. Sally 4th also manufactures a full range of high quality, precision laser-cut bases and rectangular and irregular movement trays. We now stock magnetic-basing sheets, tapes, and steel paper, making us a one-stop shop for wargames figure basing and storage. Products are supplied flat-packed, and can be assembled easily using PVA glue. No tools are required.